Serve with Saronsberg Full Circle 2015. A recipe which makes shop-bought BBQ sauce redundant. 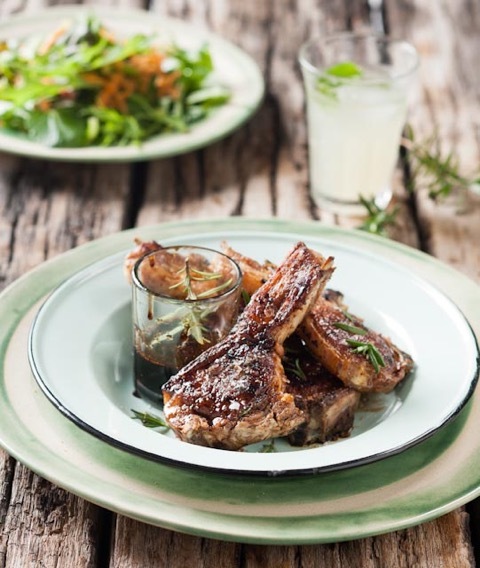 Place chops onto a clean chopping board, drizzle with olive oil and season well with salt and freshly ground pepper. Pick the leaves off two rosemary stalks and chop finely. Sprinkle over the lamb. Heat balsamic vinegar and honey in a frying pan over medium heat until sugar has dissolved. Increase heat and allow to boil rapidly for a few minutes or until reduced to half and has reached a syrup consistency. Heat a grill pan until hot and fry lamb chops for about 3-4 minutes on each side or until done to your liking. Just before lamb is done, dip a rosemary stalk into balsamic glaze and use this to baste the lamb. (Only start basting towards end of cooking otherwise glaze will burn). Serve immediately with a light green salad. This sweet yet tangy flavours of the dish will require a wine that is full-bodied but equally not too tannic – try a more robust Rhonê-style blend.